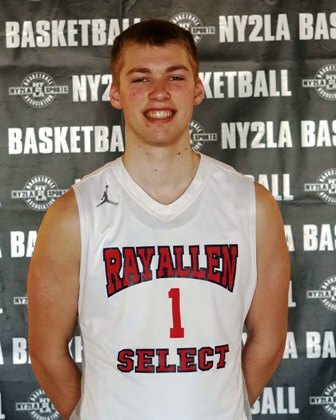 One of the players ready to make a big difference this spring on the younger level grassroots circuit is 2019 SF Marcus Domask of Waupun, Wisconsin. The talented 7th grader who competes with the Ray Allen Select program is establishing himself as one of the better offensive weapons in the class in the Midwest and continues to work to round out his game on both ends of the floor. Domask has some nice size at his age and usual position on the floor, standing 5-11 and has a good frame to develop into as he gets older. He already uses his body well against defenders and has a sort of deceptive athleticism to him that has caught opponents off guard in recent showings. He keeps a pretty calm demeanor but does not stop fighting on the floor, an attitude that helped him and his RAS squad take home a 13U tournament title at the recent NY2LA Sports 2014 Holiday Hoopfest. The future wing prospect has an uncanny knack for hunting spots on the floor to spot up and shoot from when teammates kick the ball. When he does catch it in good position, Domask has a good release, shows confidence in his shot, and is accurate from good range while also able to extend deeper when needed. But Domask’s game isn’t relegated to just being a shooter from the perimeter. He has showed the ability to take defenders off the dribble from either wing and create shots for himself where he can knock down off-balance shots, pull up jumpers or nice kissing floaters off the glass. Furthermore, Domask finishes well around the basket and is capable of playing down in the trenches comfortable if necessary depending on matchups. He has a good build and his instincts on the court help him overcome some size inside at times where he can score around some bigger opponents. Defensively, Domask again has enough size and athleticism to be effective at different levels. He helps his team rebounding and he does a nice job reading plays. As Marcus Domask continues gaining quality experience on the floor, improving his skills putting the ball on the floor, and adds more strength, his game promises to really evolve into a complete package that will be scary for most opponents to game plan around. The future, near and far, look bright for this 2019 small forward prospect out of Waupun.